Flats of heirloom tomato seedlings. For several weeks, Sadie nurtured her babies. She started them from seed, but now they are getting big, and she is pushing them out into the world. She had help from Victor, the proud papa who helped pot them up, preparing them for their new homes. Sadie is the farm manager at Bee Heaven Farm, Victor is a farm hand, and their “babies” are thousands of heirloom tomato seedlings. Not all will get planted on the farm. Many are grown for sale, and will be available at Ramble this weekend at Fairchild Tropical Botanic Garden. Picking out the best plants. 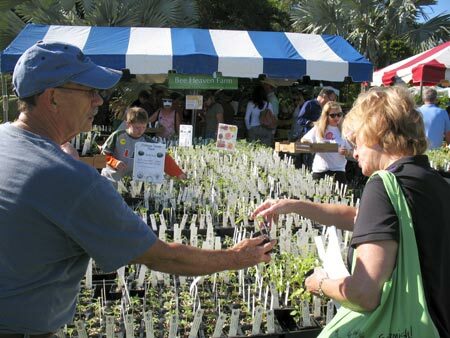 Seedlings were also available at the recent Edible Garden Festival, also held at Fairchild. It was a sight to see! 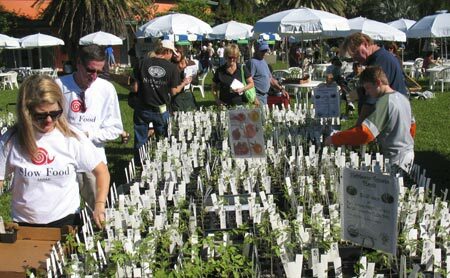 Dozens and dozens of varieties loaded down three long tables in front of the farm’s tent. There were so many seedlings it looked like a sea of small green leaves and white name tags. 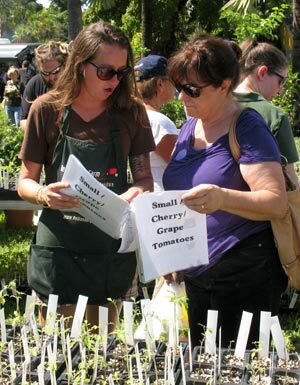 Sadie (left) helps a customer choose plants. 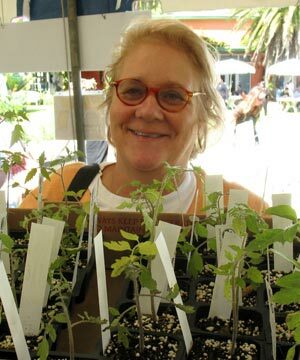 The varieties for sale are the same ones that farmer Margie Pikarsky grows year after year. She knows which ones do best in this climate, and which will have problems. Heirloom tomatoes come in all different sizes, shapes and colors. Small tomatoes are the most prolific, and they will ripen through the season. They come in several shapes — round, grape and pear (or teardrop) — and colors — red, yellow, orange, pink, white, brown and black. Yellow and orange are sweeter, and the black and brown varieties have a stronger tomato flavor. White and pink tomatoes are very pale in color, but that doesn’t diminish their flavor. Beefsteak varieties, which are familiar to gardeners from Up North, just aren’t as prolific in this climate. They will bear about five or six fruit per plant, before they succumb to heat and bugs. 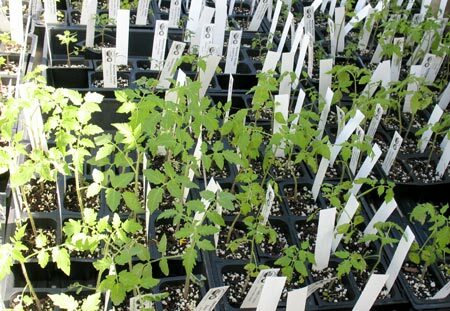 All varieties are certified organic, started in clean potting medium, and grown without any chemicals. Beth got enough plants to fill her backyard garden. The serious gardeners came out in full force early Saturday morning. They were looking for specific varieties, and scooped up armloads of plants. It was fascinating to hear that in one garden, the yellow pear did well, but in another garden, it was a struggle. Matt’s Wild Cherry, a small Everglades tomato, did well in a lot of gardens last year, and is hardy enough to bear through May. 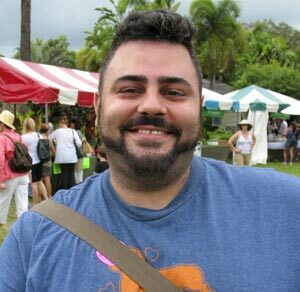 One man said he was a teacher and bought a variety of plants for his school garden. Many people were mixing and matching plants to get a wide assortment of colors and flavors. In an interesting trend, almost half the gardeners planned to grow their plants in pots on a patio or balcony. One man even brought his iPad and proudly showed pictures of 70-plus pots, complete with an overhead irrigation system, on his back patio. That was last season and he wanted to do something like that again. If you have pots and sunlight, you can grow vegetables just about anywhere. And of course, you can’t have an organic plant sale without bug drama. Sunday afternoon a small black scorpion emerged in a flat of Green Zebras. It startled two of the volunteer helpers. The scorpion looked pretty scared too, and and tried to make itself very small as people stared at it. 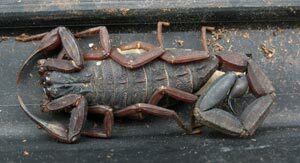 A young man ran over, picked up the flat, and heaved the scorpion into a nearby planting of bromeliads, thus ending the drama. The scorpion had hitched a ride from the farm. However fearsome, it is one of nature’s pest controls, and won’t sting people unless provoked. Don’t fear, there’s no more scorpions lurking. Come to Ramble and adopt Sadie’s babies — there’s still hundreds of plants left. Come try a variety you never grew before. No matter which ones you choose, the color and flavor of a perfectly ripe tomato that you grew yourself will be incredibly better than anything you can find at the store! Thanks to Marilyn and Buddha, who came out to pot up thousands of seedlings. Thanks to Adri, Holly, Kathy, Kristin and Marian, who helped at the Edible Garden Festival. Gardeners shopping for heirloom tomatoes on the first morning.